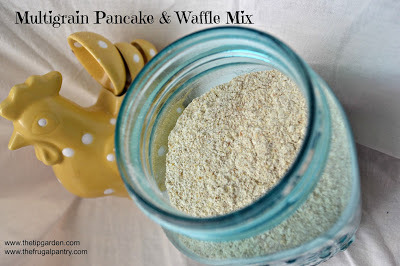 I have always been on the search for a multigrain pancake/waffle mix that was just right. I finally stopped looking after I came this recipe. It is perfect not only for your family but makes a great gift during the holidays too! Don't let the buttermilk powder scare you away! It can be found in any grocery store and is also the base for any great ranch dressing mix too, so trust me, it's worth the purchase here! You'll notice I listed the sugar as optional. It is completely up to you. My husband is diabetic and I leave it out. For us the syrup is sweet enough, the added sugar isn't necessary, but feel free to add it in if you prefer. This recipe stores for a month on the shelf or about 6 months in your freezer. Now that we are empty nesters, I make only a half batch. Store in pantry for 1 month or freeze for up to 6 months. in food processor, grind oatmeal to a fine powder. if using corn meal instead of corn flour grind corn meal to a fine powder as you did with oatmeal. Jan's Tip: Question: Is Corn Meal and Corn Flour the same thing? Answer: Not exactly. Corn Meal is ground more corsely and corn flour is ground more fine. If you are like me and only have corn meal on hand, you can grind it in your food processor till it is a fine powder to make corn flour. Combine master mix with water, egg, vanilla and oil until just moistened. Add more water as needed to reach desired consistency. Drop by ¼ cup measure onto hot griddle or pan. Flip pancakes when lightly brown on bottom cooking for another few minutes till done on both sides. Serve warm with syrup. Apple Pancakes: add 1 cup of finely grated apple, a dash of apple pie spice and 2 to 3 Tablespoons of brown sugar to batter. Pumpkin Pancakes: add ½ cup of prepared pumpkin, a dash of pumpkin or apple pie spice and 2 to 3 Tablespoons of brown sugar to batter. Combine master mix with water and eggs, vanilla and oil. Stir until just moistened. Add more water as needed to reach desired consistency. Pour by ¼ cup measure onto heated waffle iron. Cook till golden brown and cooked through. Serve warm with Syrup.